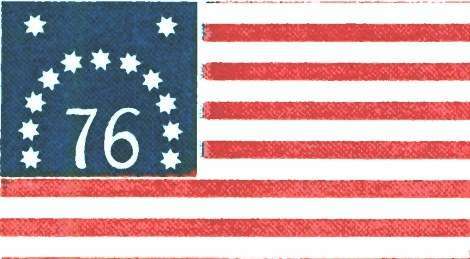 By June 14, 1777, it was high time the Continental Congress to replace a variety of revolutionary flags with the stars and stripes. The Revolution had started had started two years earlier, and it was nearly a year after independence was declared. Resolved, That the flag of the [thirteen] United States be thirteen stripes, alternate red and white: that the union be thirteen stars, white in a blue field, representing a new constellation. New England, however, continued to fly revolutionary flags alongside Old Glory. Flags had long been a symbol of independence that irked the British government. 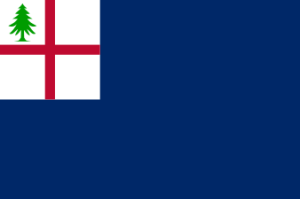 New England's Puritans, led by Roger Williams, didn't think it appropriate for a flag to bear a Christian cross. So they altered the British naval ensign flag to exclude the cross of St. George in the corner. 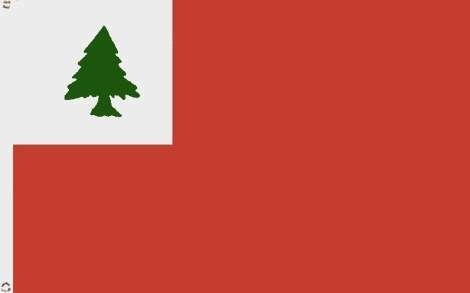 During the reign of King James II (1685-1688), the pine tree was one of the most popular symbols of liberty to appear in New England flags. It signified that New Englanders were loyal to the Crown but intended to defend their liberties. The New Hampshire Pine Tree Riot of 1772 added to the pine tree’s potency as a symbol of resistance. 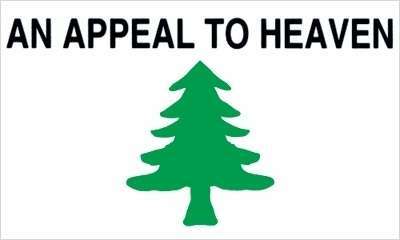 The pine tree appeared on a flag known as the Bunker Hill flag, though it wasn't flown at the Battle of Bunker Hill. The artist John Trumbull painted two different Bunker Hill flags in two versions of his painting, The Death of General Warren at the Battle of Bunker Hill. One shows a red field, one shows a blue. The U.S. Post Office in 1968 issued a stamp depicting the Bunker Hill Flag as blue. Two versions of the same painting by John Trumbull. The Bedford Flag is associated with the Minutemen of Bedford, Mass. It became a symbol of the militia's resistance at Concord. The Bennington Flag probably didn't exist when the Battle of Bennington took place in 1777, but it became a symbol of that encounter. What was flown at the Battle of Bennington was the Flag of the Green Mountain Boys, a regimental flag probably flown by Gen. John Stark. 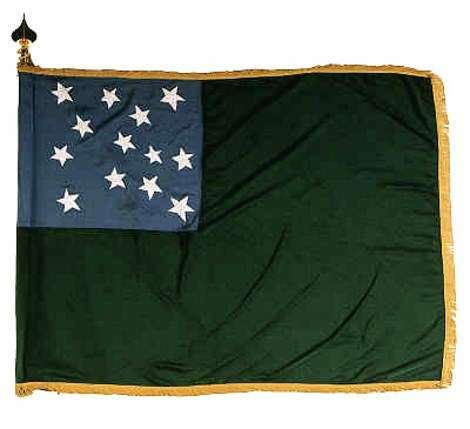 Today, the Flag of the Green Mountain Boys is the flag of the Vermont National Guard. In 1776, the Massachusetts Navy adopted a banner depicting a pine tree on a white background with the words ‘An Appeal To Heaven.’ Privateers also used it, as did a small fleet of ships commissioned by George Washington. The navy's revolutionary flags are sometimes known as the Washington Cruisers Flag. New England’s tall pine trees first built the British Royal Navy. Wasn't it time for the tall pines to build New England’s own Navy? Massachusetts adopted the Washingtons Cruisers flag without the motto as the naval and maritime flag of the Commonwealth in 1971. Taunton, Mass., was a hotbed of rebellious fervor. The town had sent lawyer Robert Treat Paine to the First Continental Congress representing Massachusetts. On Friday, Oct. 21, 1774, patriotic Tauntonians erected a 112-foot liberty pole on the town green and attached to it one of the most famous revolutionary flags: The Taunton flag. 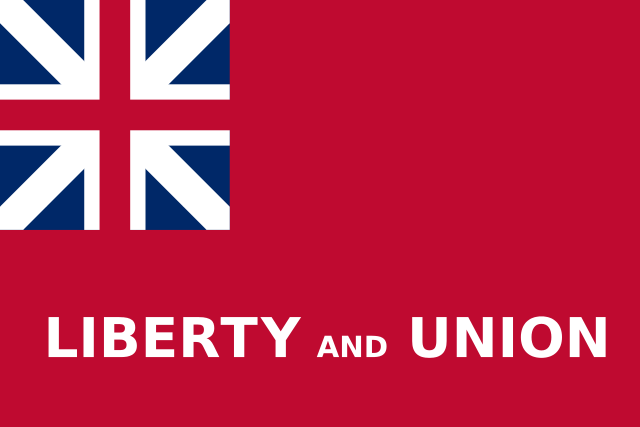 It was a British ensign flag with the words 'Liberty and Union' sewn on. All attempts for their subversion or abridgement. 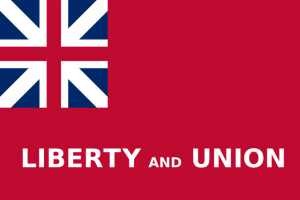 Every year, Taunton holds a Liberty and Union Festival in October to commemorate the raising of the Taunton Flag. In 2017, the festival will be held on October 21. The other states had their own revolutionary flags, of course. New York had its George Rex flag, South Carolina had its Moultrie flag and Easton, Pa., had the Easton flag, raised when the Declaration of Independence was first read publicly (at least according to legend). 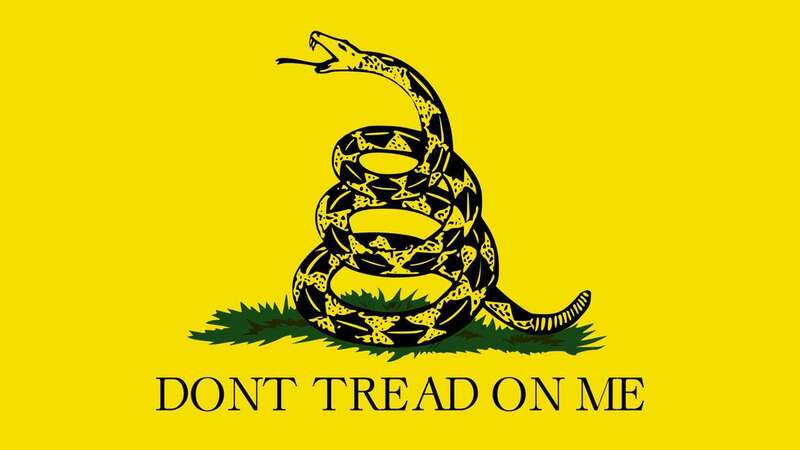 The flag was designed by Christopher Gadsden, a delegate from South Carolina. He gave one of the 'Don't Tread on Me' flags to the Continental Navy's first commander in chief, Esek Hopkins of Rhode Island. 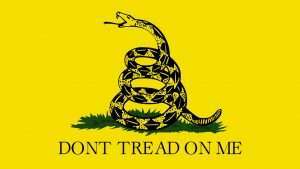 The Gadsden Flag, perhaps the most famous of the revolutionary flags. Hopkins then displayed it on the mainmast. This story about revolutionary flags was updated in 2018. The New England Flag is now the Flag of here, Lincoln County, Maine. I would like to buy a Bunker Hill New England Flag for an American Vexillologist. 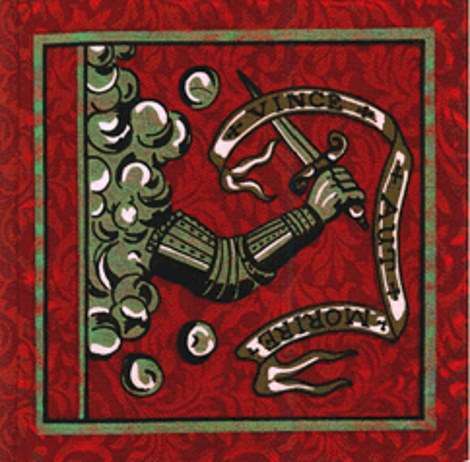 As I am an Englishman a flag incorporating the English Flag of Saint George would be good. Please direct me to a place where I can buy the flag. Shaker Village Household Tips: Special for members – Not a member? Join Today! It’s Free.